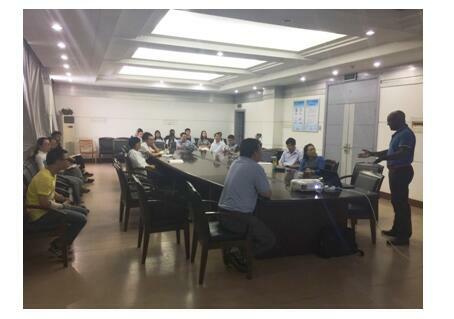 Prof. Pierre Ruterana from Centre National de la Recherche Scientifique (CNRS) of France was invited to re-visit the Institute of Solid State Physics (ISSP), Chinese Academic of Sciences (CAS) on May 25, 2018. And he gave a talk entitled “InGaN/GaN quantum wells for past green emission” in the afternoon. In his talk, Prof. Ruterana employed the high resolution transmission electron microscopy to systematically investigate the role of misfit and threading dislocations on the optical properties of InGaN/GaN quantum wells grown by MOVPE and MBE. Their investigations combine the transmission electron microscopy analysis down to atomic scale and modeling which are to be correlated The state-of-art results are definitely important to the film growth of III-Nitride materials and the device design and performance correspondingly. Pierre Ruterana is the Director of Research in CNRS and the head of the research team “Properties of Materials for Energy savings” (PM2E) in CIMAP laboratory. He is a specialist in the high resolution transmission electron microscopy technique and its applications to numerous materials including semiconductors, ceramics, catalysts and nanomaterials. Since he joined CNRS in 1990, he has contributed more than 300 scientific publications in the peer reviewed journals with more than 2600 citations. Prof. RUTERANA was the coordinator of 2 and the principal investigator of the other 3 of European funded projects. He was also the coordinator or/and principal investigator in several projects of L'Agence nationale de la recherche (ANR) and Normandie regions.